IT’S DEC. 6 in Charlotte, North Carolina, and a sold-out crowd files into the Spectrum Center. The world champion Golden State Warriors are in town for their lone trip to the Tar Heel State this season. And though Queen City native Stephen Curry isn’t in uniform, due to a right ankle injury he sustained just two days prior, Kevin Durant is doing his best to make up for whatever gap in enthusiasm might exist. Durant is drilling one rainbow jumper after the next while piecing together what will ultimately become a 35-point, 11-rebound, 10-assist triple-double on the way to a wire-to-wire 101-87 road win. But for how easy Durant makes it all look, on this night, he manages to dominate while overcoming the greatest on-court obstacle he’s ever known. Indeed, if one could identify an Achilles’ heel in Durant’s game, it might be the feckless nature of the shoes that swaddle his Achilles’ heel. Just after halftime, with Golden State up 55-43, Durant backpedals in transition following a Warriors turnover, then successfully contests a Michael Kidd-Gilchrist layup. And then, as he grabs the rebound and begins a fast break going the other way, Kidd-Gilchrist steps on the back of his foot, causing Durant’s black-and-white, yellow-swooshed KD10 to briefly soar into the air. And nine minutes later, it happens again — this time as Durant launches a baseline fadeaway over Nicolas Batum, who also comes down on the back of Durant’s right shoe. After the whistle, Durant bends his 7-foot-tall, Gumby-like frame, reaches down, and slides the shoe back on his foot without so much as re-tying it. It’s almost as if it’s something that happens so much, it hardly merits notice. Which is exactly the case. THE 2017-18 CAMPAIGN had just begun, but Kevin Durant was already in midseason, shoe-shedding form. Immediately after halftime on Oct. 20 in New Orleans, with Golden State down by 13 points, Durant finished a tough layup off the wrong foot after Tony Allen stepped on the back of his left heel, pulling the sneaker off in the process. Durant hustled to grab the shoe as the Pelicans pushed the ball back down the floor, but then — after realizing he wouldn’t have enough time during the play to put it back on his foot — opted to fling it toward the sideline. The choice to free up his right hand ended up being a wise one: After a New Orleans misfire and offensive rebound, Durant swatted not one, but two of Allen’s shots at the rim while wearing just a single sneaker. Three nights later in Dallas, as Durant was going up for a defensive rebound in the second period, he lost his left shoe and could only watch as future Hall of Famer Dirk Nowitzki put back a Mavericks’ miss. Fast forward six days, back home at Oracle Arena against the Pistons, and Durant lost the left shoe again during an awkward first-quarter fall while trying to swat an Andre Drummond layup. He managed to shed a sneaker on consecutive nights in March, too, jumping out of his right shoe while jostling with San Antonio’s LaMarcus Aldridge for a rebound, then losing a shoe on that same foot the next game after getting stepped on by teammate JaVale McGee while guarding Moe Harkless in Portland. It’s happened in blowouts, like the 21- and 24-point laughers against the Mavs and Nuggets on back-to-back nights last season. And just as often, it’s happened in some of the biggest, most scrutinized games of Durant’s pro career. His shoes ran away from his feet twice during that epic 2016 Thunder-Warriors Western Conference finals, in which Oklahoma City lost a 3-1 lead and set the stage for Durant to join Golden State in free agency two months later. He blew a tire two times during the Olympic Games in Rio that summer, including once in the middle of the gold-medal game against Serbia. Durant’s right shoe came off during his wildly hyped, highly contentious first game back in OKC. The right kick also went flying last June during Game 5 of the NBA Finals — the same night he would go on to win his first NBA championship and be crowned Finals MVP. And then, in Game 5 of the just-completed Western Conference Finals, it happened not once … but twice: The first time, Durant’s right shoe came loose with a minute left in the first quarter as he finished a layup. The second came just 30 minutes of game time later, when the same right shoe came all the way unglued after Durant bit on an Eric Gordon head-fake at the 3-point line, a foul that gave Houston three free throws — and an 84-80 lead — with just under seven minutes left in the game. All told, an extensive video analysis of Durant’s games from the past three regular seasons and postseasons reveals that the four-time scoring champ has come out of his shoe at least 31 times since the beginning of the 2015-16 campaign. That number, compiled in games against 20 different NBA teams, equates to losing a sneaker roughly every eight games or so — a mind-bogglingly high figure considering that Durant has had his own signature Nike shoe, designed to fit the unique contours of his feet, since 2008. THE THEORIES FLY as fast and as far as the footwear that flings from the forward’s feet. Perhaps it’s the shoes? With all due respect to Spike Lee, it’s gotta be the shoes, right? Or maybe it’s the feet? Indeed, Kevin Durant somewhat famously possesses some of the longest, narrowest feet that anyone who’s witnessed them has ever seen — ones that, when paired with his chicken legs, look a lot like the blades at the ends of hockey sticks. “My feet are so weird, man. I’ve got flat feet. I’ve got all sorts of calluses and corns on my feet,” says Durant, who wears orthotics and two pairs of socks during games in hopes of reducing friction. But longtime Warriors equipment manager Eric Housen, who, despite being in his mid-40s, has worked 29 years with the team, has an altogether different theory. Having seen everything that Durant is asked to do for Golden State — be a primary scorer who can attack at all three levels, a switchy perimeter defender capable of handling the opposing club’s No. 1 option and occasionally even a rim protector who cleans up back-end mistakes — Housen feels the superstar’s versatility is a factor in the shoes coming off so frequently. No player, aside from perhaps Milwaukee’s Giannis Antetokounmpo, is called upon to do as much. “He constantly has to change direction because of the different roles he plays,” says Housen, who’s taken a rather keen interest in this subject, which sometimes makes extra work for him. Housen recalls racing through the arena in New Orleans during the play where Durant tossed his sneaker toward the Pelicans’ sideline because Housen wanted to ensure no one disadvantaged the Warriors forward by playing Keep Away with his shoe as action on the court continued. Like countless other young basketballers, Durant developed a fascination with sneakers at a young age. But getting new pairs of shoes on a regular basis wasn’t realistic at times for the superstar forward, who’s spoken openly about his humble beginnings in Seat Pleasant, Maryland. “We couldn’t afford the Pennys, the Pippens, the Jordans,” Durant told The Oklahoman in 2011. “I had one pair of Team Jordans and I wore them everywhere. I hooped in them, played football in them. I had some Shaqs from K-Mart and a pair of Tim Duncans. But I couldn’t get a bunch of different ones like I wanted.” He was an Eastbay magazine die-hard, but the only size-11s his mother could get him from the catalogue were Lisa Leslie’s and Sheryl Swoopes’s Nike models. It is perhaps not unrelated, Housen notes, that for a star player — one who is literally provided an endless supply of sneakers by Nike, and who could wear new kicks every game if he truly wanted to — Durant moves on to a different pair much less often than other NBA players do. Thunder star Paul George said he prefers the feeling of a new shoe when he steps out on the court. “Fresh out of the box,” he says. Ex-Warriors guard Larry Hughes was the same way during his time in Golden State. Dwyane Wade used to go through as many as three pairs in the same game, citing how sweaty his feet would get in certain sneakers. Durant is the opposite. For as long as he uses the same pair of shoes now, Durant actually used to wear them for even longer stretches during his first few years in the league. Chang, the Nike designer, has said that Durant used to only switch out his shoes three or four times per season, the equivalent of once every 23 games. So perhaps, instead, Durant is not giving himself enough time to break in the sneakers — a premise that seems more plausible given that almost 40 percent of his shoe-shed incidents have taken place during the first month of a season, when he’s still getting used to wearing them. Here’s a fun fact: That’s the exact frequency with which he sheds a shoe out on the court. There is one other possible explanation, though. And while there’s evidence that he lost a shoe during a game as early as 2010, most all observers of this streak of sole-baring agree that it wasn’t always this bad. Those who played with Durant before he became NBA royalty express genuine bewilderment over how he suddenly began losing his sneakers so often these past few years. And still: Durant continues to opt against re-tying his shoe whenever one falls off. Instead, he simply stuffs his foot back in and continues playing as if nothing happened. Every now and then, if a student of the subject studies hard enough, they might see a look of frustration cross Shoeless Kevin’s face. 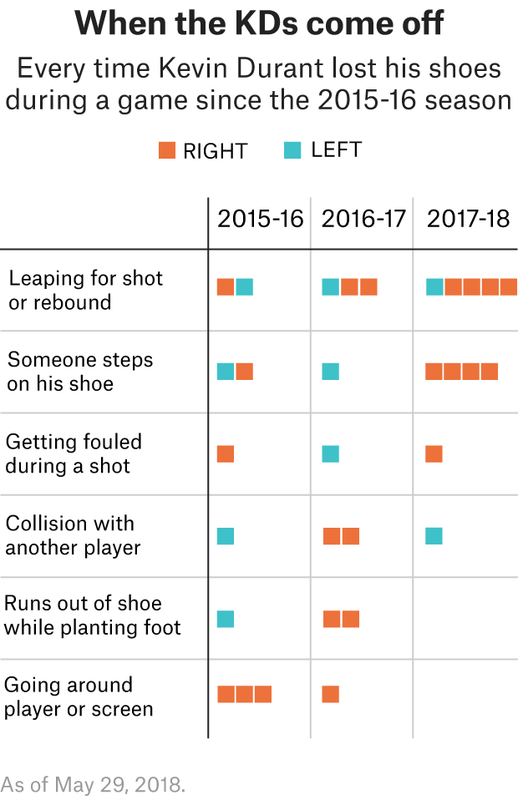 Review the video from that last season he spent with the Thunder, and they’ll find an instance of him losing both shoes — from his left foot, and then his right — within the same minute or so of action during a November game in Houston. Upon collecting the second shoe, he stands straight up and briefly stares into space before grabbing the right sneaker as if it’s somehow betrayed him. On a chilly April morning in Indianapolis, after months of studying the phenomenon, I finally got around to asking Durant about all this. Upon hearing the question — basically, how can anyone’s shoes fall off as often as yours do? — he laughed before unfolding an enormous ear-to-ear grin. Then came the moment of sole-searching truth: the reason he finds himself picking up left-behind sneakers more frequently than a Payless Shoes store associate. And so to achieve that featherweight feeling, Durant wears a size-18 while on the court — one full size bigger than what he wears when in casual settings. All of which seems like a slightly crazy notion — and one that would benefit the opposition — until you realize the extent to which it’s the opposite. On a per-100 possession basis, Kevin Durant has averaged 114 points when occupying the court without a shoe1 — more than triple the 36 points per 100 possessions he posted this past season. Looping in his other stats, he logged five dimes and five turnovers per 100 possessions sans a shoe, while shooting 9-for-12, or 75 percent. So perhaps there really isn’t much mystery at all to why Durant sees little need for both his sneakers. If you could morph into the next coming of Wilt Chamberlain, you might not find it vital to tighten your shoes up, either. We counted 21 offensive possessions that he’s been involved in the past three regular seasons and postseasons. When analyzing his stats, we also counted scenarios in which he was fouled and went to the free-throw line.